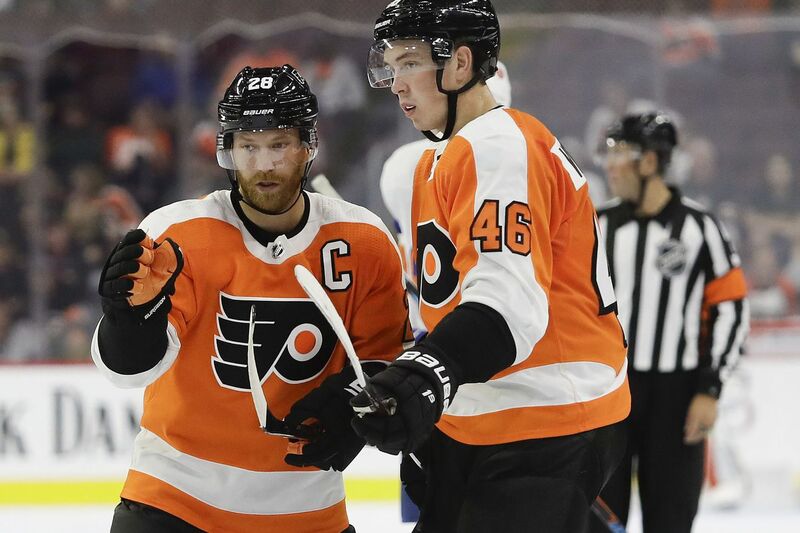 Flyers rookie center Mikhail Vorobyev (right) gets some instruction from captain Claude Giroux during a preseason game Monday. NEW YORK — The Flyers have better offensive depth in the farm system than at any time during Ron Hextall's four-plus years as general manager. For proof, look at how young forwards Mikhail Vorobyev and Carsen Twarynski have performed in training camp. Both have raised eyebrows with their strong play and are in the running for roster spots. Never mind their ages. Both have played with confidence that belies their inexperience. Vorobyev, a 21-year-old center who had 29 points in 58 games for the AHL's Phantoms last season, has been impressive in every area except the faceoff circle. The 6-foot-2, 194-pounder has shown good hands, quality playmaking skills, and an attention toward defense as he tries to beat out Jordan Weal and Scott Laughton for the third-line center spot. All three have had excellent camps. Vorobyev, who spent two year's in Russia's KHL before joining the Phantoms, "had a good year last year," Hextall said. "Maybe a little bit of inconsistency, but for the most part, he had a good year. Coming from the big rink to the small rink and transitioning [to a longer schedule] …is a lot. He did a good job. He worked hard this summer. He was in Voorhees a lot and he worked his tail off — and it's showing. "Quite frankly, he's hungry to make this team," added Hextall, who plans to make several roster cuts Thursday. In Wednesday's preseason game at Madison Square Garden, Vorobyev scored on a rebound with about five minutes left, the final tally in the Flyers' 6-4 win over the New York Rangers. Oskar Lindblom (two goals, an assist), Laughton (three assists) and Corban Knight (goal, two assists) had three points each for the Flyers (3-1). Twarynski, 20, a rugged 6-2, 198-pound winger who netted 45 goals in the Western Hockey League last season before a five-game stint with the Phantoms, has given the Flyers scoring and has been a physical presence down low – a combination that figures to make him an NHL mainstay one of these days. He collected an assist in Wednesday's game and was constantly in the Rangers' faces. In Tuesday's 5-1 win over the Islanders, Twaynski had a goal and a team-high four hits. "Carsen continues to make himself known out there," coach Dave Hakstol said after the victory over the host Isles. "He's doing a small number of things very well. He's keeping his game simple; he's playing hard, skating [hard]; he's got physicality to his game and he's been around the net a lot. He comes up with a lot of 50/50 pucks, and because of that, he's been on the positive side of a lot of shifts." Hextall made two slick trades to acquire draft picks that netted Vorobyev and Twarynski. In a cap-motivated deal in January 2016, he dealt Vinny Lecavalier and Luke Schenn to Los Angeles for Weal and a third-round draft selection that June. Twarynski turned out to be that draft pick. About six months before that trade, the Flyers had the 99th overall draft pick, obtained the previous year from Columbus in the Scott Hartnell-R.J. Umberger deal. The Flyers traded down with Los Angeles to get the 104th overall selection in 2015 and a sixth-rounder in 2016. At 104, they took Vorobyev. Vorobyev, who has two goals in his three preseason games, starred for Russia at the 2017 IIHF World Junior Championships. He led all participants with 10 assists while playing in seven tournament games and helping Russia win a bronze medal. Goalie Brian Elliott, making his first appearance of the preseason coming back from February abdominal surgery, played the first period and stopped 11 of 13 shots before being replaced by Carter Hart, who turned aside 25 of 27.